Restaurant Review + Giveaway - Cuban Pete Sandwiches, Downtown Cinci | The Food Hussy! 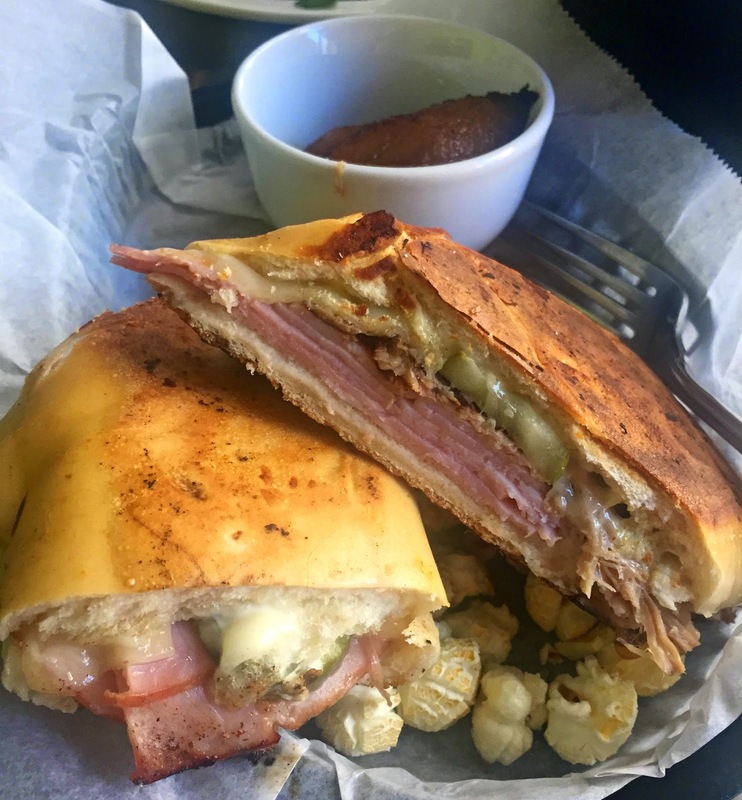 My friend Jen over at Suburbinnati told me about a new Cuban place that had opened up downtown and a great experience her family had there - so I had to check it out. 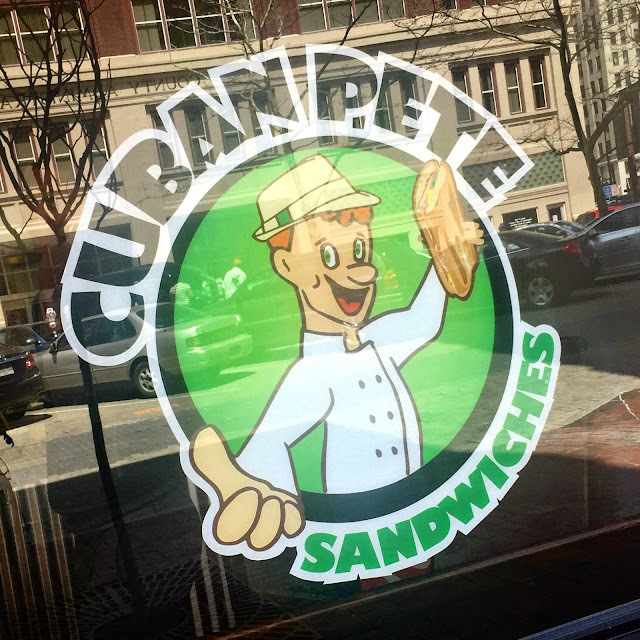 Cuban Pete started as a food truck but recently opened in the old Tom + Chee location on Court St. 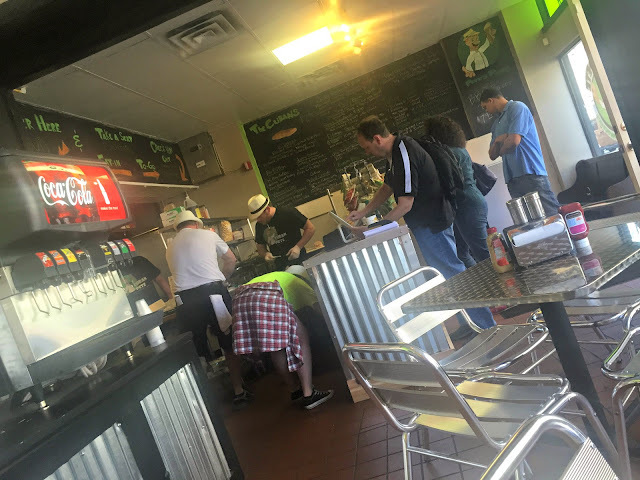 Inside is very similar to the old Tom + Chee - same layout & furniture - just with a new neon green & black paint job. I went for the El Cubano ($7.95) - I wanted to start out with the purist approach. This is a traditional Cuban sandwich with ham, roasted pork, swiss cheese, pickles and mayo on fresh baked bread. You can add a fountain drink & a side for $2 at lunch. They also throw a smattering of kettle corn under the sandwich for good measure. The sandwich was good - I like a Cuban sandwich but don't love it. This was a really good one and it was SUPER filling. I couldn't even finish the whole thing and that RARELY happens. You could almost split this with a friend - it is massive! 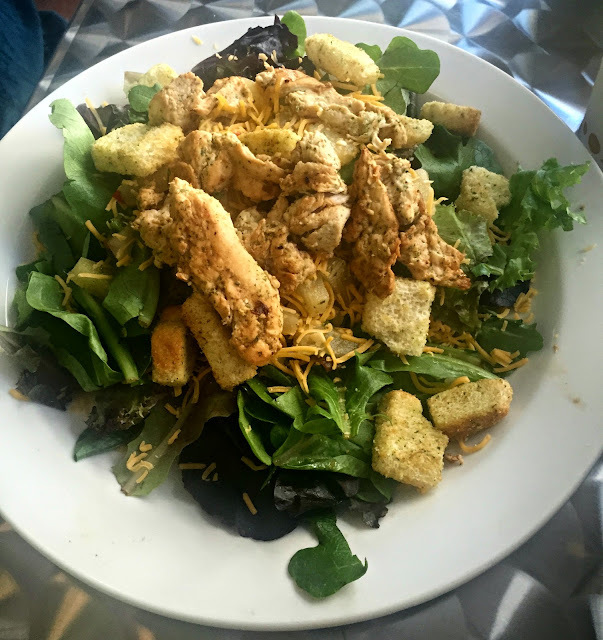 Dawn got a Chicken Salad - I think it was something Jamaican - it was a special that day. The salad was also very plentiful. The chicken was tender and had a really good seasoning on it. She also took home this giant bag of Kettle Corn - it's from a Findlay Market vendor. 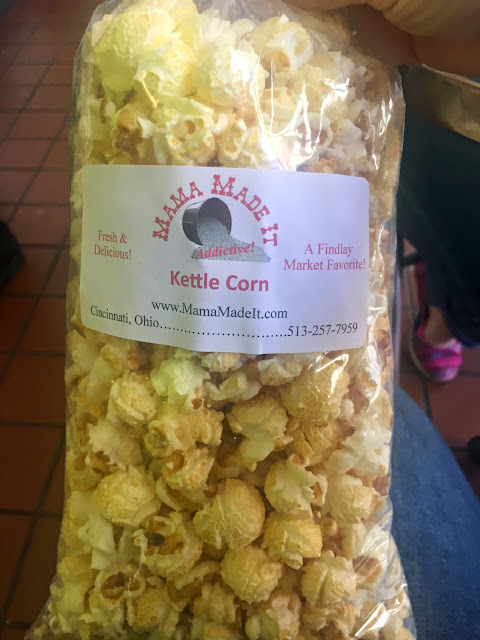 I didn't think I liked Kettle Corn but I had a bite and it was actually good! All this time I've been missing out! It's like a light version of caramel corn! I got a side of Plaintains with my sandwich (you can also choose croquetas, corn or fries). 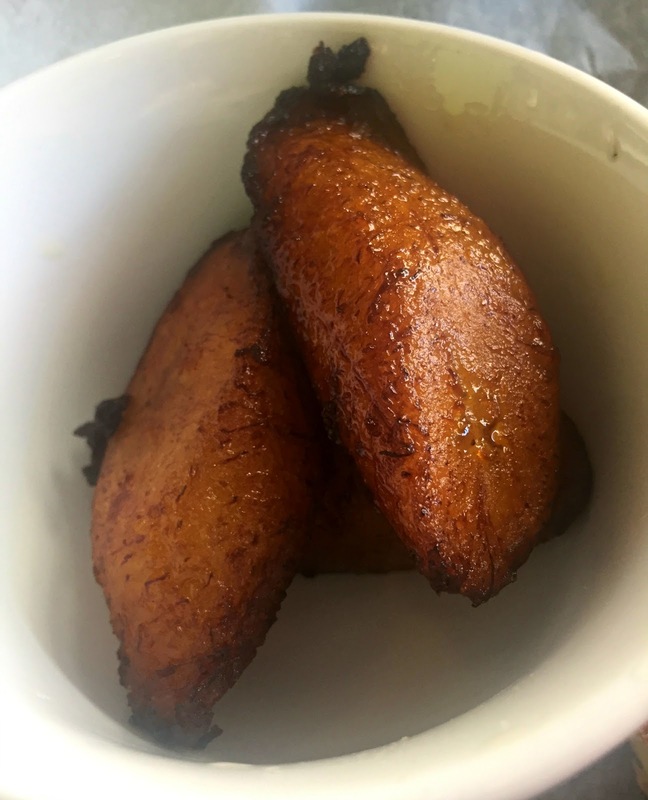 I had plantains once with an Ecuadorian family and loved them - which is odd since I hate bananas. These weren't as good as those - they had them thinner and fried - like pickle chips. These were good though - it's so sweet and does have a banana type of texture (which is usually my issue with bananas) - but I liked them. It's a very sweet rich food though and one was enough so I shared with Dawn. Why Should You Go? It's a good sandwich and it's really filling! It's definitely worth a try! Giveaway Time! That's right - I have 2 gift cards up for grabs. First chance is to check out their menu page and come up with a new sandwich idea that you think would be perfect on the menu! We'll pick our favorite sandwich and you'll get a $15 gift card (and might see your sandwich on their menu!) I'll also give a $10 gift card away to one person that randomly enters via any of the options below.